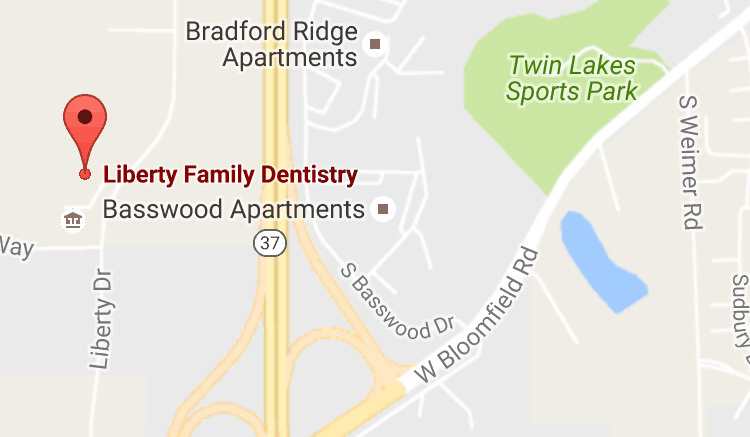 You've probably seen many Liberty-crafted, beautifully straight smiles around Bloomington. We specialize in comfortable, comprehensive orthodontic care for patients of all ages. Conventional orthodontic treatment (clear or metal braces) for both children and adults offers the most comprehensive approach to treating more complex issues ranging from crooked teeth to jaw and bite concerns. Liberty’s meticulous approach throughout the orthodontic journey produces great results while keeping the process on schedule. Traditional braces provide a proven path to a beautiful, lasting smile. Invisalign® creates beautifully straight teeth without braces by using a series of removable, and comfortable aligners – invisible to your friends, family and coworkers! These aligners are also removable, so you can eat and drink what you want while in treatment. Plus, brushing and flossing are no problem. Invisalign® provides a quicker, less expensive straight-teeth solution for patients 12 and older. Parents know that the decision to straighten your teen’s teeth can affect his or her life significantly. With school, sports, their first job and even prom, traditional braces may not be the ideal choice. Invisalign for teens can give your child the self-confidence of a great smile without the restrictions of traditional metal braces. Invisalign Teen actually costs about the same as traditional braces. We suggest checking your dental insurance plan - orthodontic treatment with Invisalign Teen is covered by many major dental insurance policies. A beautiful smile increases self-esteem, confidence, and overall appearance. Not surprisingly, research also reveals that it may also lead to greater opportunities and higher income levels. Orthodontically corrected teeth lead to better lifelong oral health. They are easier to clean and less prone to chipping and decay while also reducing the chance of gingivitis and gum disease. Call 812.339.2811 or use the form below to schedule a complimentary orthodontic consultation.